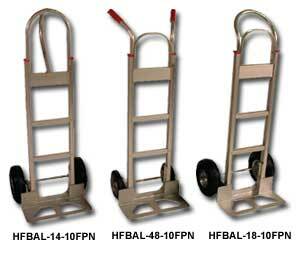 Lightweight handtrucks are easier to maneuver and have more balance and overall performance than steel handtrucks. Frame and cross tubes are made of heavy duty extruded aluminum. Available with or without stairclimbers. FOB Shipping Point. Wheel Description Handle Type Cap. (lbs.) Nose Plate Size W x H Wt. (lbs.) Product No. Price Ea. Optional 10" x 2-3/4" semi-pneumatic wheels available.